Be Ready for The Holidays! It’s time for Mixing up the Holidays with a KitchenAid Mixer Giveaway! 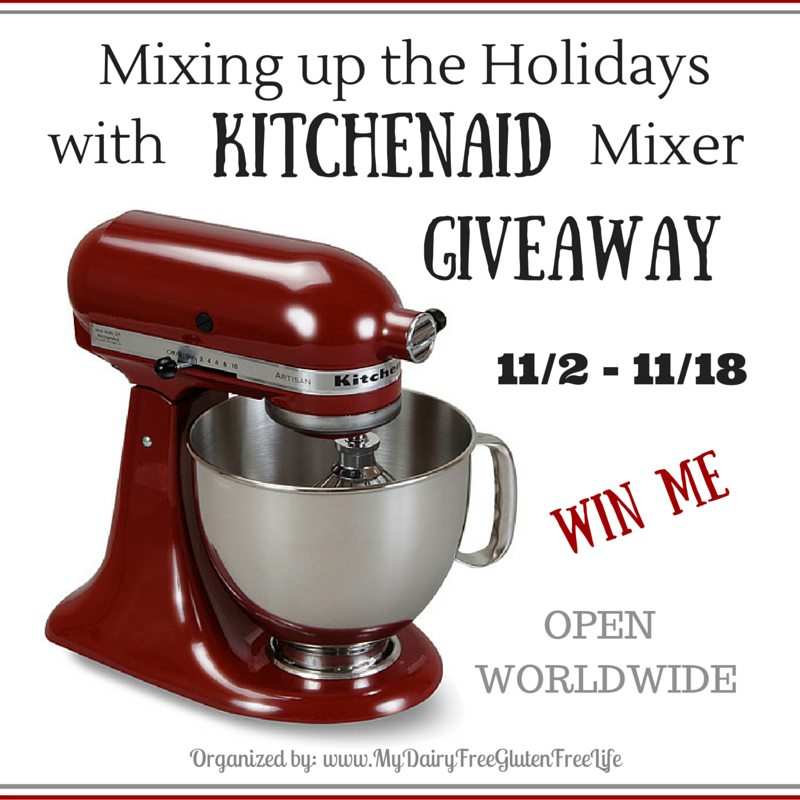 Just in time for lots of holiday baking, a great group of bloggers have joined together to bring you this “Mixing up the Holidays with KitchenAid Mixer Giveaway”! This KitchenAid Giveaway is a Blogger Sponsored Event which means the bloggers, who you will find on the Rafflecopter for entry options, have donated money to help pay for this 5 qt Kitchenaid Artisan Stand Mixer! One lucky reader will soon be mixing up all kinds of goodies with this Kitchenaid 5qt Artisan Stand Mixer! Although the prize photo shows a holiday gloss cinnamon color, the winner will have a large selection of colors to choose from! Disclaimer: This blog did not receive compensation for the published material in this post. No purchase required to enter this giveaway. Void where prohibited. Odds of winning are determined by the number of valid entries received. Entries will be verified. Winner will be chosen by Random.org and will be emailed via the email address used to enter the contest. A new winner(s) will be chosen if original winner(s) has not responded within 48 hours of email notification. My Dairy-Free Gluten-Free Life is responsible for product shipment. This giveaway is not administered, sponsored, endorsed by, or associated with Facebook, Twitter, Google, Pinterest or other social media outlet. Disclaimer is posted in accordance with the Federal Trade Commission 10 CFR, Part 255 Guides Concerning the Use of Endorsements and Testimonials in Advertising. I would love to win the Kitchen Aide! I love baking breads and right now am doing it all by hand! Love your blog too Nettie! I would love the mixer. I would make a new pumpkin bread recipe i just found. I would immediately make whipped cream! Then I would make something to use it with—maybe a pie. I would make pumpkin cheesecake! I would love to make a pumpkin cranberry muffin with the new Kitchenaid Mixer! Love the giveaway! Perfect time of year. Would make batches of cookies of course! I would love to make a cake for our Thanksgiving Dinner. Christmas cookies and more Christmas cookies. I would make my gf pizza dough! Thanks for the opportunity! I’d make some homemade cookies with my kids!